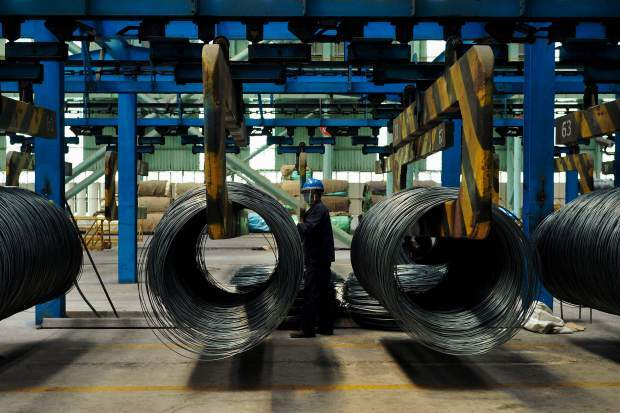 A worker transfers steel cables at a steel factory in Qingdao in east China's Shandong province. The Trump administration on Monday, July 16, brought cases against China, the European Union, Canada, Mexico and Turkey at the World Trade Organization for retaliating against American tariffs on imported steel and aluminum. At first blush, President Donald Trump’s escalating trade war with major Colorado trading partners such as Canada, China, the European Union and Mexico would not appear to have too much impact on a resort area such as Eagle County, with very little agriculture or manufacturing. After all, we’re not growing a lot of corn in Gypsum or building a lot of cars in Eagle. But expert observers say the interconnected nature of the global economy means Eagle County is already seeing a spike in the cost of goods ranging from lumber, steel and aluminum in construction to tech products to food in local grocery stores and restaurants. Chris Romer, president and CEO of the local Vail Valley Partnership chamber of commerce, echoed the sentiments of the national chamber. “Retaliatory tariffs imposed by other countries on U.S. exports will make American-made goods more expensive, resulting in lost sales and, ultimately, lost jobs here,” Romer said. “Tariffs are simply a fear-based response to an age-old problem. Trump has already imposed a 25 percent tariff on $34 billion in Chinese goods, which prompted retaliation on an equal amount of American goods by China. In an effort to reduce the $375 billion trade deficit with China, the United States is now considering tariffs on an additional $200 billion in Chinese imports, which would no doubt trigger additional Chinese retaliation. Ultimately, the stock market may take a hit — although it’s remained steady to date — and reduced revenues for American companies and high net-worth earners would impact both the real estate and tourism industries in Colorado’s high country, experts warn. Construction of high-end homes in Eagle and Summit counties has already been impacted by an escalating Canadian trade war, with the United States imposing new tariffs on Canadian lumber, steel and aluminum. The cost of Canadian softwood lumber is up 80 percent since last year — 40 percent of that coming in 2018 — as the U.S. tries to offset Canada’s subsidies for its lumber industry. But Boyd said the lumber wars with Canada have been going on for years. In fact, ongoing U.S. efforts to curtail the impacts of the deeply subsidized Canadian lumber industry on U.S. forestry products predates President Obama and can be traced back to the Ronald Reagan administration in the 1980s. Nevertheless, homebuilders are feeling the pinch even more in recent months and are passing on those price increases to homebuyers. Colorado beef and pork prices have been impacted as heated trade-war rhetoric with Mexico over renegotiation of the North American Free Trade Agreement continues and China also targets U.S. imports. Colorado corn, a primary feed source for Colorado livestock, has seen a price drop of 20 percent since June 1. “We’re such a global economy, and we really are impacted and affected by everything else that happens in the world,” said Kim Reddin, of the Colorado Corn trade association in Greeley. “We’re very interconnected, and trade is very much a part of that picture. The Trump administration last month announced a $12 billion emergency agriculture relief package, but corn growers were lukewarm to that approach. Colorado Democratic Sen. Michael Bennet was even more blunt. The jury is still out on the local impacts of the trade wars on food prices. Colorado’s burgeoning distillery business is feeling the pinch from an escalating trade war with the European Union, which Trump called “a foe” and has targeted U.S. alcohol imports for retaliatory tariffs. Ryan Thompson, founder of the local 10th Mountain Whiskey & Spirit Co., said they were approached in the last year about possibly going into European markets but didn’t pursue it. Now he’s glad they didn’t, and Canada was already a non-starter due to onerous taxes and tariffs. Thompson said brewers have been more impacted because of aluminum price increases.